Shrewsbury – Complementing a longtime career as a visual artist of multiple media, Jackie Rezuke of Shrewsbury has volunteered her skills by painting stage sets for the town’s public high school musicals for a decade. 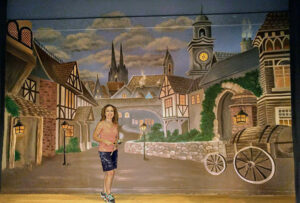 Additionally, she’s in her ninth year volunteering as scenic artist for Shrewsbury’s community theater Regatta Players. After graduating with a bachelor’s degree in fine and studio arts from Assumption College in 1984, she learned photo retouching on the job at Photographers Color Service in Worcester. She worked for 15 years beginning in 1986 for Winthrop Handy at Winthrop Studios in West Boylston. There, she did photo retouching and restoration, and painted oil portraits of retiring judges. 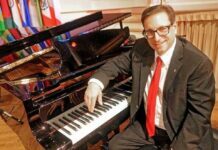 Rezuke is an active member of Shrewsbury Schools Music/Theater Association, a nonprofit organization that helps support the district’s performance arts programs. In 2011, she accepted an invitation to get involved with Regatta Players from Bonnie Narcisi, a founding board member and now-retired Shrewsbury district director of music and drama. 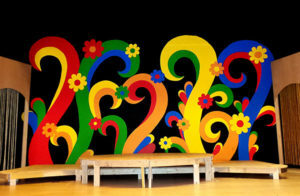 In addition to designing Regatta’s logo, Rezuke volunteered as scenic artist for its productions of “The 25th Annual Putnam County Spelling Bee,” “The Wedding Singer,” “First Date,” “9 to 5; the Musical” and “Shout!” Rezuke’s biggest challenge was last summer’s “Young Frankenstein,” for which she painted a detailed backdrop depicting the village of Transylvania. On a smaller scale, Rezuke painted a window-view of a vineyard for the set of Regatta’s first non-musical “Drinking Habits,” to be presented Friday, Feb. 15; Saturdays, Feb. 16 and 23 at 7:30 p.m.; and Sunday, Feb. 24, at 2 p.m. (snow date Friday, Feb. 22, 7:30 p.m.). 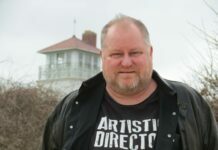 Performances will take place at Southgate at Shrewsbury’s Flanagan Theater, 30 Julio Dr.
Order “Drinking Habits” tickets by emailing [email protected]; calling 508-925-0583, 10 a.m. to 5 p.m.; or online at regattaplayers.com.